Usually our 10 pound Dachshund is pretty obedient. That is if he perceives we are close enough to grab him. If he is more than five feet away all bets are off on his obedience. He reckons if we can’t grab him, he is a free agent. It was kind of like that today. 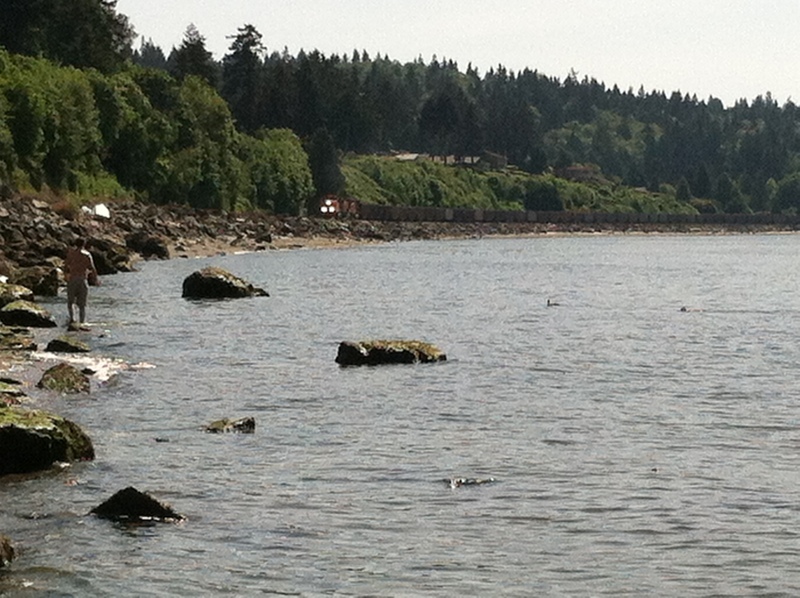 Although we had not noticed him slipping silently away when we were looking out across the Puget Sound. It was such a beautiful, freakishly summer-like spring day in the Northwest. We had walked along the beach towards the pier. The tide was coming in but there was still plenty of time to get back to the part of the beach that does not disappear when the tide comes in. The part we were standing on would slowly get smaller and smaller and the water would eventually come all the way up to the rocky embankment. When we did notice that Archie was not right beside us, it was too late. He was already madly swimming after a Mama duck. We, of course, called and whistled but he completely ignored us. Pure instinct had taken over. All loyalty to his Master and Mistress thrown to the wind with the scent of that duck in his nostrils. The mama duck swam back a little closer to the shore to be joined by her six chicks. They kept up a steady chatter of cheeps as they swam after her. Now Archie was chasing her and her 6 chicks. She took him deeper and deeper. 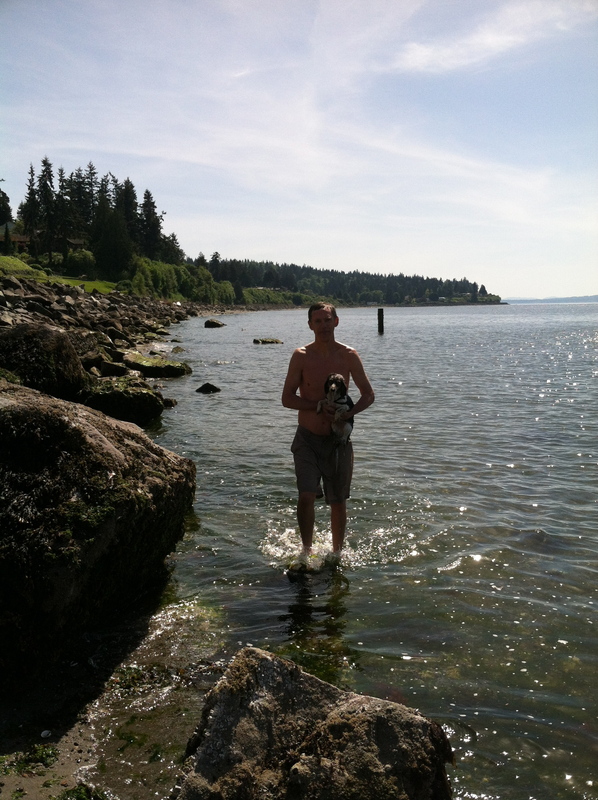 He didn’t think twice about the frigid temperatures of the Puget Sound or the angry fowl he was chasing. She kept zigging and zagging and taking him deeper and deeper. Finally she flew over his head flapping and took him in the opposite direction of her chicks. They must have had a brief pow-wow. Something like: “OK duckies, I’m going to distract this crazy dog and you guys swim that way and I will swim this way.” It worked for a while but Mama couldn’t ignore her chicks bleating cheeps for too long, so she swam back across Archie to make sure they were OK.
By this time Bill was taking his shirt off, emptying his pockets and heading out to the shore across from where this drama was being played out. All the while, I was praying that Mama duck would lead Archie a little closer to the shore so Bill could grab him. She eventually did start coming close to shore and Bill jumped into the frigid waters. He swam close enough to Archie to almost grab him. Archie finally came to his senses and let Bill separate him from his prey. The two of them came back to shore. Rescue completed. I am sure that Mama Duck would thank us if she could, or maybe not. Maybe she would scold us for our poor obedience training. We hurried back along the ever disappearing shoreline picking our way through the rocks in time to get to the non-disappearing part of the beach. When we came home Archie, planted himself in his favorite chair and slept the rest of the afternoon away.